Walter’s grandfather was Richard Newburg (1517-1569) and his grandmother Elizabeth, the daughter of William Horsey by his wife Dorothy. Richard Newburg has a well established family pedigree1 and although I have not studied this in any great detail it appears to have been well researched by a number of people over many years. It shows an unbroken male line of descent from Norman nobility for 20 generations down to our Rector of Symondsbury. It starts about the year 920 descending through Roger de Beaumont; Sire (Count of Meullant) who furnished sixty armed vessels for the fleet marshalled by William the Conqueror. When William invaded England in 1066 Roger was left in charge of the government of Normandy. Descent continues through his son Henry de Beaumont (died 1123) who accompanied William on his march into the midlands in 1068 with his brother Robert de Beaumont. They both received grants of estates in Warwickshire and Henry was made the first Earl of Warwick in 1088, and appointed castellan of Warwick Castle . The Dictionary of National Biography2 confirms that he was also called Henry De Newburgh after his Lordship Neubourg, near Beaumont-le-Roger, in Normandy and it was this surname which descended in England. Henry's son Robert de Newburgh received from King Henry I of England the grant of the manor of Winfrith in Dorsetshire which descended through many generations, together with other lands in Dorset that had been gained by inheritance or marriage. Interesting as this families history is, it is not the subject of this short biography, so I leave it with a link to the Pettibone Family History ; for those wishing to know more. When Walter’s grandfather Richard came of age he inherited from his father Walter Newburgh (1487-1517)3 his primary residence in Netherbury which was called “Othe Francis Manor”. Anciently a manor but by then a farm in the tithing of Ashe, it was situated about 2 miles South East of Ashe on the River Birt. He also inherited other estates and land in Dorset at Bryand Puddle, Kingston, Swanage lands, Corfe-Castle, Orchard, Worth and Winterbourne-Zelstone. Richard married Elizabeth Horsey about 1552 and they had 5 children: Elizabeth (c1553); Walter (c1555-1599) [Son and heir see below] ; Richard (c1557-c1629); Katharine (c1559) and William (c1561-1632)4. To be buried in the church as my overseers think convenient. To wife Elizabeth for life, Â£20 per year out of my farm of Othe Frauncs, and my second best bed; also the use of all my household stuff until my son Walter Newborrowe be twenty-one, then to be delivered to him. To my daughters Elizabeth and Katheryn, Â£100 each, when married with the advice of Mr. William Horsey, Esq., my father-in-law, their mother and my overseers. My sons Richard and William to have Â£10 per year out of my farm of Othe aforesaid, toward their bringing up, until my heir Walter Newborrowe be twenty-one. To my said son Walter my best cloak embroidered with velvet and a jerkin of the same. To my godson Michaell Laurence two hogs. To each of my servants, Peter Hill and William Borodge, 5s in money, two sheep and their livery coats. To Mr. Willm Hoddye of Pilson, for his pains, my best cross-bow and racke. To my son Walter my second-best cross-bow and racke. To John Bolman two sheep. To the poor of Netherbury 40s., among them John Coxe of Brodenham, widow Stacy, Russelle's wife, and William Bosshoppe. To Mr. Prise, schoolmaster of Netherbury, 10s. for his paines towards my children. To Mr. Sydwey my greatest cross-bow and "wenlesse". To Mr. Larder my second bow and "wenlesse". To my neighbor John Herne, my handegunne being at Chedyoke. To young Mr. William Hoddye my apparel at John Bolman's. To my brother Giles Straungewaies my roan trotting mare. To my son Walter my new rapier and dagger. To my son William my English sword and dagger. To my sister Harryes a cloak. To my sister Susan a silver spoon and 5s. To my sister Anne Simson, a pair of sheets. To my sister Dorothie a silver spoon. To Mr. Thomas Howard my bay ambling nag. To the Lord Thomas Howard my coal-black ambling nag. To John Herne my best saddle. To my brother Horsey a gown. To Xpofer [i.e. Christopher] Symmes at London a gray colt. To the wife of Richard Furrent two silver spoons. To William Foster, Nicholas Mall, and John Hayborne, two sheep each. To Henry Durk's eldest son two sheep. To Mr. Sydwaye my clensing mill. All residue of my goods I give to my sons Richard and William, they to be executors. Overseers, Willm Hoddye Esq. ; William Horsey, Esq., my father-in-law; John Larder; and Hugh Sydwey, gent. To my cosen Lewes Horsey, a silver spoon. To my son Walter, a new satin doublet now in the hands of Frauncs Taylor at Byddon. ~ Witnesses: John Webbe, curate; Robert Peche; John Milles; Peter Hill; Henry Laurence; and Paule Dolinge, clerk. ~ January 30, 1568/9, a commission was issued to Elizabeth Neweborrowe, relict of deceased, to administer the estate according to the will during the minority of Richard and William Newborrowe, executors. Our Rector of Symondsbury was named after his father Walter NEWBURGH Esq. 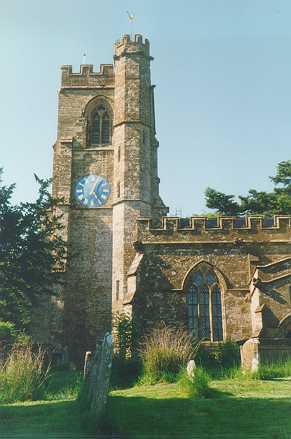 of Worth Francis in Netherbury. His mother was Elizabeth the daughter of John CULLIFORD Esq. of Encombe in Corfe Castle on the Isle of Purbeck7. According to the Visitation of Dorset6 carried out in 1677 his father was a member of the Middle Temple in 1576 although I have not so far been able to locate where he was educated. Nor have I been able to find their marriage. Walters will clearly shows that he had two surviving daughters, plus his son and heir also called Walter, and his youngest son Thomas. Elizabeth's Will makes it clear that the surviving daughters were Emme and Elizabeth and that at the time of Walters death she was already pregnant with Robert. 1. Emme Newburgh (c1591-) A number of genealogists include her as the eldest child born c1591. Evidence quoted for this relates to Chancery depositions in 1626 and 1629 between John Baker who brought a Chancery suit against Rev Walter Newburgh of Symondsbury in regard to the division of the estate of Walter Newburgh. Among the witnesses in the case heard on 20 Mar 1629; Charles I [1626/7] was William Newburgh of Symondsbury aged about sixty five years. He deposed that he witnessed a release by Baker to the defendant; and again on 25 Sep 1629 William Newburgh Gent aged about sixty-eight years deposed on the same matter. I have certainly managed to locate the marriage of an Em [presumably a shortened version of Emme] Newberie in 17th December 1613 to John BAKER in St Edmunds church Salisbury Wiltshire8 so that would make her about 22 years old when they married. Significantly she is referred to under her married name in her mothers will written in 1615. With the other known children being born in relatively quick succession and her father dying in 1599 it seems about right. Also William Newburgh would have been the brother of Walter Newburgh (1555-1599) as named in Richard Newburgh's will above as he was born c1561 and lived until 16329. 2. Thomas Newburgh (1592-Bef 1598) baptised in Netherbury Dorset on 12 Mar 1592/310 but died shortly thereafter11. 4. Walter Newburgh (1595-1631) [Son and heir see below] baptised in the church of St Mary the Virgin in Netherbury on 27th May 1595 10. 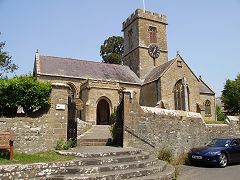 Much of this lovely church still survives the tower and chancel for example dating from the 14th Century12. The 12th century font in which he was christened is still there as well. Close by is Parnham House built in the 16th century and the home of the STRODE family for over 300 years. The two families inevitably remained close for many years. His life is covered in greater detail below. 6. Colonel Thomas Newburgh (1598-1659 ) baptised in Netherbury Dorset on 14 April 159810 . Thomas went on to marry Mary the daughter of Edward BORGHOWSE from Suffolk and they later settled in County Tirone Ireland where they raised a family14. For the following account of his life I have relied upon work done by other genealogists15 which I have no reason to question. When a young man he settled in the north of Ireland, where he was successful in taking advantage of opportunities offered by the political disturbances which commenced in the Plantation of Ulster in the time of James I. and continued during the Civil War. In the will of his uncle William Newburgh of Frampton, co. Dorset, dated 5 Oct. 1632, he is mentioned as "my cosin [nephew] Thomas Newburgh now in Ireland". By the will of his younger brother Robert Newburgh of London and of Sotwell, co. Berks, dated 18 Oct. 1642, he was left the reversion of lands in Highworth, co. Wilts, which led to litigation for his son nearly half a century later. ii. Charles, was married and left descendants in Ireland. Walter died at the relatively young age of 44, his will which I have transcribed below from an original copy held at the National Archives16 was proved in London on 17th May 1599. After his death Elizabeth re-married to a Robert ODBER although I have not located their marriage they had a son William ODBER. By the time she wrote her will on 8th May 1615 she was living in Wareham Dorset and was already a widow for the second time. She was buried at Corfe Castle in Dorset on 29 October 161820. I have also transcribed her will below which was proved on 10th June 1619. In the name of God Amen : I Walter Newburgh Esq: do make my Last Will and Testament in writing of all my goods and chattels of all of my lands and tenements wherewith God hath blessed me with all. First I commit my soul to the hands of my merciful Saviour Christ Jesus who with his precious death and passion hath redeemed me, And my body to the Earth from whence it came - to be buried in such place and in such convenient and Christian like sort as my executors shall direct. And as for they my lands whereas heretofore I have made a conveyance of all my lands called "Westhome" 17 in Purbecke to the use of my daughters until my son Walter NEWBURGH shall come of full age I will that my trusty friends Richard SWAYNE, Robert STROWDE, Lawrence HYDE, my father HARVY my brother CULLYFORDE18 my Cozens Robert ASHLEY and Thomas STRANNGEWAYES shall have the use and occupation possession and disposition of the said Lands called "Westhome" until the full age of my said son Walter NEWBURGH to employ the profits thereof to the use and benefit of my said two daughters towards the paying of them a several portion towards their marriage. And I devise all other my lands tenements and hereditaments whereof I have any power or interest to dispose by this my last will unto my said trusty friends and kinfolk and to their assigns until such time as my heir at the common time? shall of full age nevertheless upon especial trust & confidence that with this dues and profits thereof together with my goods and chattels all my debts may be first paid and with the rest of the same profit all my children shall be maintained and kept and the overplus of the same profits shall be divided that with the profits of the said land called "Westhome" limited to my said daughters there be an equal division thereof amongst my said two daughters and younger son equally to be divided, that in the whole their three portions may be equal. And I will and bequeath to my beloved wife the use and overportion of all such goods as shall by the discretion of my executors or the more half of them be left unsold for payment of my debts and for so long time only as shall please my executors or the more half of them. And of such goods and chattels as shall be sold for or towards the payment of my debts I will that my said wife shall have the preferment in buying or the refusal of them. And I do heartily entreat my said wife out of her own joynture27 to overease the portions of her children and mine are habilitated [made able?] shall (forever?) as I doubt not but she will because I have ever found her kind loving and obedient unto me and especially if she shall marry again after my death therewith I refer to her discretion. Postscript: I will and bequeath to every of my said Executors a ring of gold of such value as my wife shall think fit wherein there shall be a posie [posy] "in memorium amiti abropti" 19. Item: I will and direct unto Thomas NEWBURGH my younger son my farm of "Westhome" to have and to hold immediately after the estate therein of my said two daughters determined for and during the term of ninety nine years if he shall so long live yielding and paying therefore yearly unto my heirs the old and accustomed yearly rent which was I remember three pounds twelve shillings. Item: If any of my daughters or my said younger son shall happen to die before their marriage or ages of one and twenty years then the said surpluses of the said rents and profits shall all be paid unto the survivor or survivors of them. Item: I give and bequeath to my son Robert NEWBURGH my son One Hundred and Fifty Pounds of good and lawful money of England to be paid unto him when he shall accomplish the full age of twenty-four years. Item: I give and bequeath to my son Thomas NEWBURGH Fifty Pounds of good and lawful money of England conditionally that he sell not his estate in "Holme" which is within the County of Dorset to be paid unto him when he shall accomplish the full age of twenty-four years. Item: I give and bequeath unto William ODBER my son One Hundred Pounds of good and lawful money of England to be paid unto him when he shall accomplish the full age of twenty-four years. Item: I give and bequeath unto Edward HORFORD my servant Four Pounds of good and lawful money of England to be paid three months next after my decease. His families history and circumstances meant that he was brought up to move comfortably among the very best of the governing families in the area. In 1599 his father died leaving his estates in trust for him until he reached his age of maturity. He was educated at Hart Hall Oxford 21 where he matriculated on 16 February 1609/10 at the age of 14. He was awarded a BA degree on 29 January 1611/12 and his MA on 5 July 1614. On 27 June 1618 his mother Elizabeth, by then the widow of Robert Odber, purchased the advowson of the Parish of Symondsbury22 about 4 miles from Netherbury. This gave her in ecclesiastical law the right to appoint a member of the anglican clergy for the Parish, which was a valuable living, and was obviously designed to secure his future. His mother died in Oct 1618 and the advowson descended to him and he joined the church being ordained deacon at nearby Watlington Parish Church Oxford on 19 December 1619. He was ordained priest there the following year on 11 June 162023 and continued studies in theology at Brasenose College in Oxford. He was licensed to preach on 7 May 1623 and on 24th of that month awarded his Bachelor of Divinity. On 17th June 1624 he appointed himself under the advowson as Rector of Symondsbury in Dorset a post he retained until his death at the young age of 36 when his place was taken by the Rev Henry Glenham. It is difficult to know exactly what the relationship between Walter and the Rev. John WHITE was like. He was seven years old when John White first arrived in Dorchester to start work on his new social order and Walter was still young enough to be living in Netherbury. Dorchester however was a major place of business and where the governing classes often lived or met and the Newburgh family would be no exception being closely associated with the Strode family of Parnham who came to Dorchester on a regular basis. His father having died he could not fail to be influenced by such a dominant character as the Rev John White who masterminded the recovery of the town after the devastating fire of 1613 when Walter was still at university in Oxford. He must have been impressed by the progress being made on his trips back home. John White also moved in the same social circle as he did and used his influence to inspire the wealthy to contribute to the towns restoration. His mother paved the way for his entry to the church possibly influenced by John Whites example. We also know that John White regularly held seminars to which he invited clergy from near and far to discuss Puritan issues of the day and with his study in theology he is likely to have attended at least some of them. 1624 seems to have been a critical year in his short life not only gaining his bachelor of Divinity but becoming Rector of Symondsbury and marrying into the Strode family as well. His early investment into the Dorchester Company shows his active support for John Whites values and his 2nd marriage to Jane BROWNE brought him into direct contact with her father John BROWNE another investor in the Dorchester Company . It is clear from Rose Troup's book on John White24 that even the female members of the aristocracy took an active part in supporting John Whites schemes where she quotes from Hutchens " Lady Browne of Frampton as early as 1631/2 contributed £10 to employ the poor in work, and this was handed to the Governor of the Hospital so that, according to her request, her name might remayne in record to posterity amongst many worthy benefactors". This statement has been attributed by Rose Troup to Jane Browne in the indexing of her book, but in my view was more likely to relate to her mother. Jane Newburg (nee Browne) however was no shrinking violet as is demonstrated after Walters death by her later marriage on 18 Jan 1635/6 to the renowned Dr John STOUGHTON. He was an ardent puritan deeply interested in the settlement in New England. His two brothers Israel & Thomas and stepson were among the first settlers of Dorchester Massachusetts and there was some talk about him joining them. In 1635 he and John White fell under suspicion of non conformity, his and John White's studies were raided and correspondence between them and John Browne who was the main executor of Walters will were seized concerning the use of money set aside for Walters children. The executors of his will drawn up in 1631 also included two other investors in the Dorchester Company in the shape of Christopher & Sir John EARLE the latter even being the governor of the Dorchester Company. In accordance with these beliefs its not surprising to find in Walter's will considerable bequests to the poor of five separate parishes. Walter married firstly Katherine STRODE24 of Stoke Abbas [Abbott] 2 miles from Netherbury on 28 September 1624 at Symondsbury but she died, probably in childbirth, being buried there 11 November 1625. In a number of genealogical trees Katherine is said to be the daughter of Sir Richard STRODE (1584-1670) by his first wife, which I have not investigated, but if correct she was baptised at Beaminster 10 Jan 1608/9 making her only 17 when she died. His second marriage was to Jane ( - 1679) the daughter of John BROWNE JP (1582-1649) of Frampton. Four years after his death she remarried to Dr. John STOUGHTON. Impremis: [In the first place] For my Soul I bequeath it into the hands of God hoping only to be saved by the merits and mediation of Jesus Christ And my body to be buried in the chancel of Symondsbury aforesaid. Item: I make executor of my said will in trust to the use of of my son John NEWBURGH; Sir Walter EARLE of Charborough in the County of Dorset Knight; John BROWNE of Frampton in the said County Esquire; Christopher EARLE of the Middle Temple London Counsellor of Law; and John BROWNE son of the forsaid John BROWNE and student in the Middle Temple aforesaid gentleman. Item: I give to my loving wife Jane NEWBURGH besides her joynture27 already conveyed unto her, as much of my household stuff plate and bedding, after it is inventoried, as shall amount to the sum of one hundred pounds to be chosen by her. Item: I give unto old Edward HORSFORD and his wife who have been ancient servants to my father and my self Four Pounds a piece to be paid unto them within three months after the day of my death provided the said Edward HORSFORD make a true and just attempt [account?] unto my said executors before the said time of what money or goods he hath of mine in his hands. Lastly for my funeral expenses the consideration of my other servants and bestowing any more or other part of my estate to charitable uses or for payment of any annuities which are by me due to any. I do refer those things wholly to the discretion of my executors to do and pay therein what they shall see just cause for according to mine ability And in witness thereof I have hereunto set my hand and seal the twenty sixth day of May in the year of our Lord God One Thousand Six Hundred and Thirty One. 1. This family seems to have already been researched at some length. There are records on the Church of Latter Day Saints main website including pedigree and ancestral files and a number of public and private family trees on ancestry.com. typically there are some differences but that for the Pettibone family for example seems to be well researched containing detailed information including transcriptions of important wills related to the family. Much of this information has been drawn from official sources. These records suggest that his grandfather Walter was the eldest son of Richard Newburgh (Newberowe) (1517-1568/9) and this is confirmed by his inheritance of Othe Francis Manor. 4. Walters youngest brother William (c1561) was educated at Queens College Oxford where he obtained a BA 3 Feb 1583/4; an MA on 1 July 1590. He may have become a student of the Middle Temple in 1595. 5. The Will of Richard Neweborrowe or Newborrowe of Othe Frauncs, Dorset was proved 30 Jan 1570 and is available on the National archives Website Records of the Prerogative Court of Canterbury Ref PRO 11/52 Name of Register: Lyon. I am surprised that the summary of the will given above does not say more about the distribution of his extensive estates so it might be worth checking the original for an exact transcription. 6. The Visitation of Dorset 1677 made by Sir Edward Bysshe Knight transcribed by GD Squibb QC FSA Chairman of the Dorset Quarter Sessions 1953-1971 published by the Harleian Society London 1977. Page 8 Jane Browne marriage to Walter Newburgh of Worth Francis , Page 15, Marriage of his daughter Elizabeth to William Coker; Page 50/51 Newburgh family pedigree. 7. I am aware that some genealogies state that she is the daughter of Anthony Culliford but I have not located any evidence to support this to date. The 1677 Visitation of Dorset page 50 under the Newburgh Pedigree clearly states that she is the daughter of John Culliford of Encombe and this is how I have recorded her. John Culliford's pedigree is also given in the 1677 visitation for Dorset but deals as expected with the male line of descent. The Pedigree of Henry Culliford of Encombe in the Isle of Purbec is shown in the 1623 Visitation of Somerset and a slightly different version given in the the 1623 Visitation for Dorset where it says they originate from Collyford in Devon and both show Anthony as his eldest son. 8. Church of Latter Day Saints International Genealogical database - The record is from their parish register extraction programme and was professionally transcribed and entered onto the database. As such it records all the marriages of that parish and should not be confused with individual church member family tree entries which are more suspect. 10. Baptism registers of the Parish of Netherbury in Dorset quoted in the Visitation of 1677 [I do not currently have access to these registers which are held at the Dorset History Center in Dorchester England and reference to them would probably add more information about his family - would be grateful for any contributions]. 11. Thomas's baptism only is quoted in the visitation which also lists a younger brother also called Thomas. Although I have yet to get access to registers held at the Dorset History Center there is little doubt that he died young; certainly before they named their youngest son Thomas again in 1598. Also the visitation shows the line of descent as being 1st from Walter and 2nd from the younger Thomas and this can only be the case if the first child named Thomas had died had died. Some genealogies record his sister Alice Newburgh's death as March 1593 but I have no confirmation of this - her baptism is in the 1677 Visitation but so was that for Thomas. Her fathers will in 1599 refers to only two surviving daughters and her mothers Will in 1615 makes it clear that these were Emme and Elizabeth so Alice must have died prior to 1599. 19. The "posy" ring was the most common type of love ring in use since the Middle Ages. The name "posy" was derived from the amatory inscription which this type of ring bears and which is usually in rhyme or "poesy". 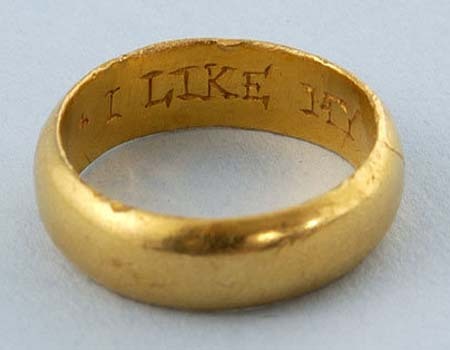 These rings were widely used in the Middle Ages (but are now hard to find). Posy rings were usually given by both men and women as an expression of regard, friendship, attachment, or even love. The posy ring reached its peak of popularity in the 16th and 17th centuries. The posies on medieval rings were usually inscribed on the outside of the hoop (which was flat). In later times, they were usually inscribed inside and the hoop was more rounded. By the 17th and 18th centuries, most posy rings were used as wedding rings. Although some of the inscriptions were originated by the donor, there were also a number of standard inscriptions which could be bought already engraved on the rings -- Perhaps someone out there can help with the translation - the nearest i can get is "in memory of friendship interrupted"
23. His university record and the Clergy of the Church of England data base does not record his earlier appointments in the church. This is usually because it is difficult to tie together disparate records from which the church database is still being constructed. I am sure however that I have correctly located his appointments as deacon and priest even though there is at first sight a difference as these earlier records suggest he was educated at Brasenose College which is at variance with the alumni which shows Harts Hall. This is because after his degrees at Harts Hall he studied theology at Brasenose for his bachelor of Divinity degree. These earlier appointments are recorded under the name Walterus [i.e. Latin for “Walter”] Newbroughe. There is no entry in the alumni for this alternative spelling and no ongoing career record on the church database. The appointments are also right when they should be i.e. after graduation at university and before he was granted a licence to preach in 1623 and he became Rector in 1624. I have also come across a ref in the third edition of “The History and Antiquities of the County of Dorset” by John HUTCHINS, edited by W. SHIPP & J. W. HODSON, published by J. B. Nichols & Sons, Westminster, 1860-74 which refers under East Stoke which was close to Winfrith and associated with the Strode family to a "Walter Newburgh of Brazenose college Oxford MA for the year 1620". 27. "Joynture" Wiktionary says “An estate settled on a wife, which she is to enjoy after her husband’s death, for her own life at least, in satisfaction of dowry"